A healthy lifestyle involves many choices. Among them, choosing a balanced diet or eating plan. So how do you choose a healthy eating plan? Let’s begin by defining what a healthy eating plan is. A healthy eating plan that helps you manage your weight includes a variety of foods you may not have considered. If “healthy eating” makes you think about the foods you can’t have, try refocusing on all the new foods you can eat. Fresh fruits ― don’t think just apples or bananas. These are great choices, but try some “exotic” fruits, too. How about a mango? Or a juicy pineapple or kiwi fruit! When your favorite fresh fruits aren’t in season, try a frozen, canned, or dried variety of a fresh fruit you enjoy. One caution about canned fruits is that they may contain added sugars or syrups. Be sure and choose canned varieties of fruit packed in water or in their own juice. Fresh vegetables ― try something new. You may find that you love grilled vegetables or steamed vegetables with an herb you haven’t tried like rosemary. You can sauté vegetables in a non-stick pan with a small amount of cooking spray. Or try frozen or canned vegetables for a quick side dish — just microwave and serve. When trying canned vegetables, look for vegetables without added salt, butter, or cream sauces. Commit to going to the produce department and trying a new vegetable each week. Calcium-rich foods ― you may automatically think of a glass of low-fat or fat-free milk when someone says “eat more dairy products.” But what about low-fat and fat-free yogurt without added sugars? These come in a wide variety of flavors and can be a great dessert substitute for those with a sweet tooth. The DASH eating plan was originally developed as an eating plan to reduce hypertension. (DASH stands for Dietary Approaches to Stop Hypertension.) However, the plan also represents a healthy approach to eating for those who do not have a problem with hypertension. No! Healthy eating is all about balance. You can enjoy your favorite foods even if they are high in calories, fat or added sugars. The key is eating them only once in a while and balance them out with healthier foods and more physical activity. Consume them less often. If you normally eat these foods every day, cut back to once a week or once a month. You’ll be cutting your calories because you’re not having the food as often. Eat smaller amounts. If your favorite higher calorie food is an afternoon chocolate bar, have a smaller size or only half a bar. Be careful! This technique works well for some people, but others may find it is too tempting to have their favorite food available, even in smaller amounts. Try a lower-calorie version. Use lower-calorie ingredients or prepare it differently. 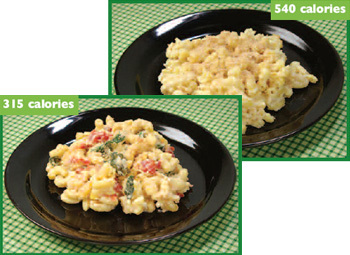 For example, if your macaroni and cheese recipe uses whole milk, butter, and full-fat cheese, try remaking it with non-fat milk, less butter, light cream cheese, fresh spinach and tomatoes. Just remember to not increase your portion size. Being consistently healthy in your eating choices is the key. Making the same healthy eating choices over time can lead to better eating habits. By thinking more positively and focusing on what you can have, you’ll help yourself establish healthy eating habits.